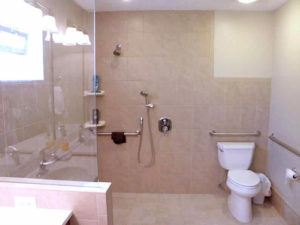 Handicap showers are an integral part of an accessible bathroom. If you use a wheelchair or other assistive device, they’re a must-have option. Why? Because there are few things that can help you as much to maintain your independence at home. Honestly, the benefit of these showers go beyond the personal freedom they empower a person to have; this bathroom option can also contribute to the beauty of your home. By combining the functionality you need in your daily life, and the features that reflect your lifestyle and taste, you end up with a bathroom that is as individual as you are. Curbless – There is no lip to have to step or roll over to enter the shower. This easy transition reduces the risk of accidents. More space – Mobility devices require that you have more open area to maneuver. ADA guidelines (though not specifically for individual homes) recommend a shower area of 36”x36”. That is not practical in most cases. That is why you regularly see showers that are 60” long (or longer), or 42” wide (or wider). These larger sizes give you the space you need. Of course, smaller bathrooms can be accommodated with good design. Handheld shower head – A handheld shower head is only a luxury for someone who has never had to wash themselves from a sitting position. It will make your life easier. It will also make showering a lot more enjoyable. Multiple shower heads – Combining a handheld shower head, with one or more additional stationary shower heads, helps you create a spa-like experience. Bars for balance and safety – Grab bars in the shower area help you get the leverage you need to stand, move, or rest safely. Shower seat – A built-in or wall-mounted shower seat is a great option for handicap showers. Non-slip surfaces – There is no reason why shower tiles have to be slippery. Today, there are both textured tiles and coatings you can apply to tiles so they are slip resistant. Easy-to-use controls – Placing shower controls in the right location makes them easier to reach and use. 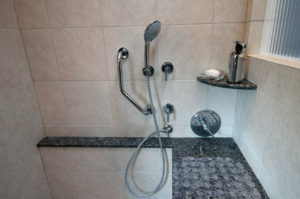 Handicap showers are part of an overall handicap bathroom strategy. They contribute to having a wheelchair accessible home. They are indispensable for the people that need them, and should be included as part of a handicapped remodeling project. If your bathroom is not setup to meet your personal needs (or those of a family member), DeVol Design.Build.Remodel is one of the most experienced accessible remodeling contractors in the greater Cincinnati, OH and Northern Kentucky areas, including Loveland, Mason, Montgomery, Amberly Village, and others. We welcome the chance to discuss your needs at home. We can show you how we’ve been able to help other people remain independent with our handicap remodeling services. Let us help you see the possibilities for your home, so it can better meet your needs now and in the future.